Alright, this is the first bit of software I've ever released to the general public so bare with me while I figure this out! 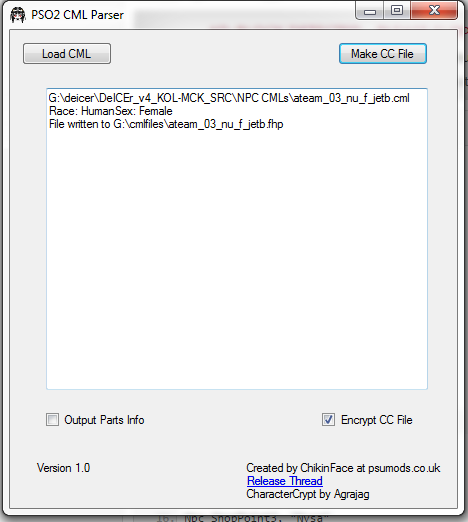 This tool will take a CML file and convert it into a file that the character creator can open. This file should work in all instances of the character creator, including the Episode 4 demo. One of the uses and probably the main reason a lot of you are here is it can be used to make a clone of an NPC. I will warn you however that the process is pretty technical compared to other methods out there. Beware that this will for the most part only get you the base sliders and some colours. It won't get you parts you don't own or are not included in the Character Creator demo. Requires Microsoft .NET Framework 4.5.2 to run. You will need to supply your own CML files. What complicates matters is NPCs typically aren't labelled by name, so you'll need a reference list to know which CML to get. Please refer to the 2nd post for information regarding reference lists and a technique for obtaining CML files. Make sure that the CMLparser and CharacterCrypt exes are in the same directory. You won't be able to encrypt the CC file otherwise. With that said, on to the instructions. 1) In the PSO2CMLParser window, click on Open CML. It'll pop up a dialog. Navigate to the CML file you wish to process. If all goes well, some simple bio info will be displayed in the textbox. Don't worry about any "Unhandled Tag" errors, but do take concern with any others! 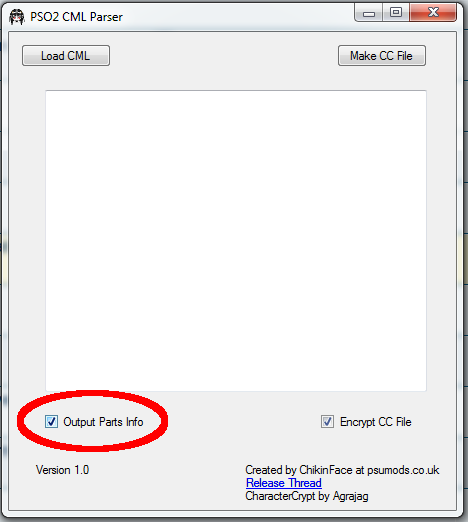 2) If the last step went without any hiccups, click the "Make CC File" button. If successful, it should tell you the filename and where it saved it. 3) Copy the file to your My Documents/SEGA/PHANTASYSTARONLINE2/ folder if it isn't already there. 4) Try to open it up in either PSO2 or the Character Creation demo. If all went well, you should be able to open it. Extra) If you want the parser to attempt to get you the names of the character\s components (such as hairstyle name, makeup, etc) check the "Output Parts info" box. This will run the IDs it finds against a dictionary of part-names. If it can't find them, it'll output "Unknown <partname>". Unfortunately, some NPCs use unique versions of parts that are unobtainable normally (example: Sukunahime has a unique version of her outfit). As such, this method won't help you with those parts. While there are obtainable versions of some NPC's unique parts, there is no guarantee this is the case for all unique parts. As such, to make your clone you may need to make do with something else that's "close enough". You're on your own for that. This tool will not get you voice or personality data. it acquires. So far, all cmls I've passed through it have come out correctly, but I make no guarantee that the software is bug-free. If you notice any bugs, major or minor, let me know in this post. Agrajag - Creation of CharacterCrypt and general support. v.1.0.1 - Fixed issue with whitespace in directory names. While I can post some reference lists, beware that they may be out of date and may not include any NPC released after this post. It's just here for convenience. Dated around 1st March 2016. Any NPCs added after this may not be on this list. The NPC ID can be mapped to the cml file. Its structure is typically np_npc_id.cml. 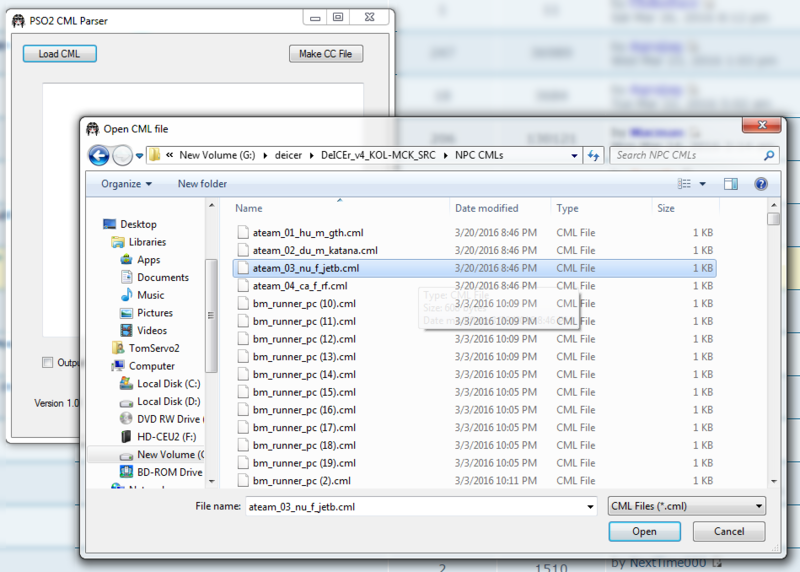 If you have cml files, usually searching the id number is enough to get it. Note that a lot of recently added NPCs have different naming conventions. The most ideal situation would be; have a file list of ice archives with decrypted names, get the archive with the cml you want in it and then de-ice it. Unfortunately for various reasons this ideal situation isn't usually available to us. Your best chance is to use De-icer's multi function. Click "multi" and select the directory you wish to bulk extract. I recommend not doing this on a list of more than 3000 files, generally. Note that De-icer crashes on v3 files I believe, either way de-icer crashes on some archives. 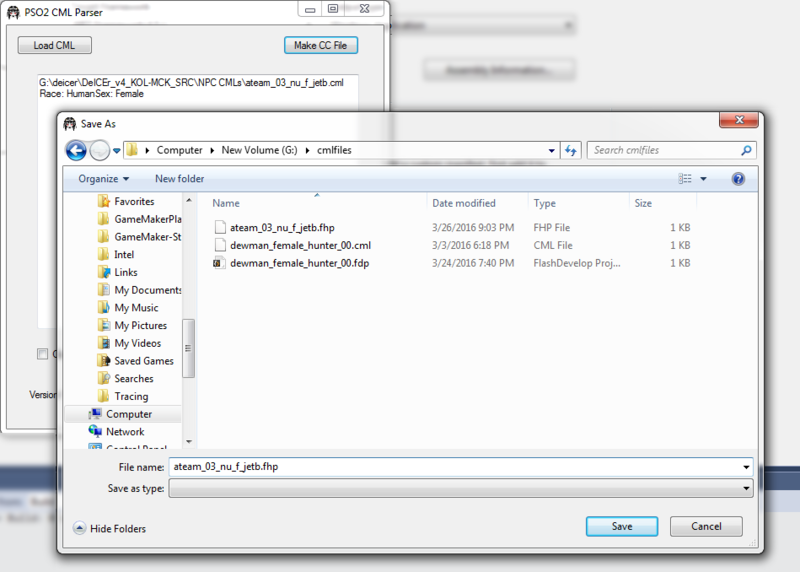 The most convenient way to know which these files are is to let De-icer crash and then remove the last file it was trying to scan as well as all files it succesfully scanned and then start again. You may need to change sorting options in your folders so that windows arranges hexadecimal numbers in the correct order (refer to this page for help with Windows 7: http://www.alliancegroup.co.uk/windows7 ... -order.htm I can't help with other versions of Windows). Once de-icer has done its thing, use windows search to look for "cml". This should list any cml files that happened to be extracted. Copy and paste these files somewhere and you should be good to go. If this is all too technical for you (I did warn you!) then there are alternative methods available to you. Aida made a thread some time ago compiling a bunch of character creation files together. This is not an all-inclusive archive however, plus they're generally the results of manual editing to get a character as closely resembling an NPC as possible. As such, there may be accuracy issues. This list is seemingly created from the results of Asqventls mod (which has been discontinued). It seems a larger character pool may be in the works down the line. Probably be better for someone to post the list of cml files. Has there been an update to this? I noticed its having issues getting layered wear. Not been updated for a while, no. I think all I need to do is update the text files? I did notice it would fail to find certain items in general though. It's not perfect, but it's an optional thing that may help you find the parts you need heh. I actually designed it so it'd help find client resources for use with re-building characters and NPCs outside of PSO2. Dian333 made a lot more progress with that... I've been meaning to come back to this but I've been knee-deep in other things and I only have so much focus. Anyway I'll post again if/when I update this thing. Chikinface wrote: Anyway I'll post again if/when I update this thing. Would it be possible to create cml files from e.g. fdp files? 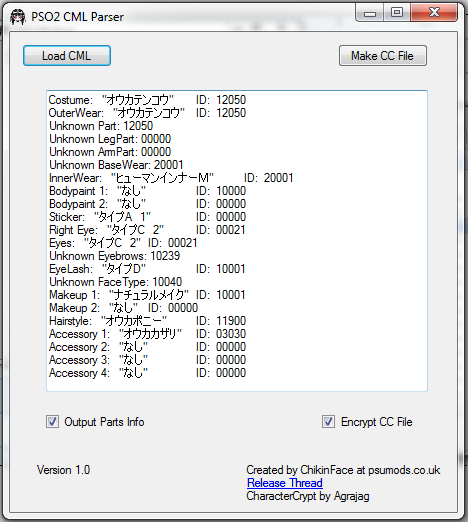 I wanted to register to psumods.co.uk and ask Chikinface in the PSO2 CML Parser thread if it would be possible to make cml files from e.g. fdp files. Anyone know how to contact him/her? Or can someone please ask him/her if it would be possible to make cml files from character files, please? There\s currently no functionality to do so, but it is definitely possible. The structure may need to be better understood so that the game will accept it, mind... like I'm fairly certain that it would accept it with my current knowledge but I won't know til I try. I'm not however saying that I will try. I don't really see the use of the functionality? At best you could turn your characters into NPC replacements. It may have use for custom private server content I guess?